Wiley loved the Memorial Parade. A Committee member for twenty-three years, he walked along the parade route passing out flags and taking pictures and videos. In recent years, he delighted the crowd dressed as a soldier, Teddy Roosevelt and George Washington. 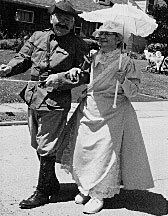 Wiley and his wife Helen introduced Malvern to the Cakewalk in the early 1990’s. He did so from fond childhood memories in his hometown of Palmerton, PA. Although not one to seek center stage, he loved being in the center of the Cakewalk circle, looking down the pointer and seeing the excitement on winners’ faces. Dr. Behler served in the Army Veterinary Corp from 1958, right out of Penn Veterinary School, until he was discharged as a Captain in 1961. Upon his return, he married his beloved Helen and together they raised five children. Wiley passed away last year on July 4, 2005. We’re thinking of you Wiley, the Parade will not be the same without you. The military band in the Parade today is the oldest military music performance group in the state, with a history of uninterrupted service of more than 60 years. It was organized as part of the 28th “Keystone” Division Headquarters Company prior to WWII. At the beginning of the war, the band was inducted into federal service and served for the duration, earning distinction in defense of Wiltz, Luxemburg during the Battle of the Bulge in Dec. 1944. The band’s decorations include the Meritorious Unit Commendation and the Luxemburg Crois De Guerre. While serving its mission with the 28th “Keystone” Infantry Div., the band has performed throughout the nation including performances for Presidents Ford and Reagan and the 500th Anniversary of Columbus’ voyage to “new world”. The band performed in France for the 70th anniversary of WWI, and at the 100th anniversary of the birth of Dwight Eisenhower, the Supreme Allied Commander in WWII. In 1994, the 28th participated in the 50th anniversary of the liberation of Belgium and Luxemburg. Most recently, the band traveled to Bosnia to perform for the troops of the 28th Division and in November of that year returned to Luxemburg to celebrate the anniversary of the defense of Wiltz in WWII where it had fought 60 years before. At present, the 28th “Keystone” Division Band is based in Hollidaysburg, PA and is under the command of WO2 Jeffrey Jaworowksi.